The Body Shop's Oils of Life skincare and bodycare range launched in Singapore recently, and I have here 3 of the products from the collection: the Intensely Revitalising Essence Lotion, the Intensely Revitalising Facial Oil, and the Intensely Revitalising Gel Creme. There is also an accessory, the Twin-Ball Revitalising Facial Massager, which is meant to massage the products into your face. 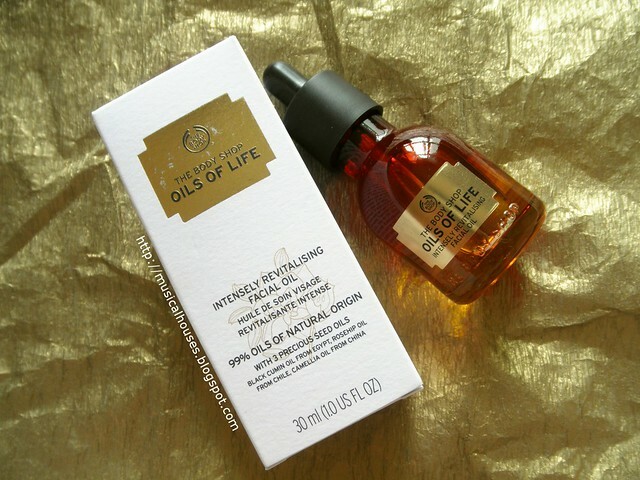 The Oils of Life launch date was 3rd September, so for once I'm not super late with my reviews, haha. The Body Shop Oils of Life Skincare Collection: With "3 precious seed oils"
As you might guess, the selling point of these products is the oils in them. The Body Shop advertises them as containing "3 precious seed oils", which are black cumin oil from Egypt, rosehip oil from Chile, and camellia oil from China. And the packaging for this line is pretty gorgeous and luxe-looking too, with the rich, golden amber hues of oils and lotions. I'm not that much of an oil kinda person, but I really like the look of these! I mean, don't tell me that shade of gold doesn't look appealing. 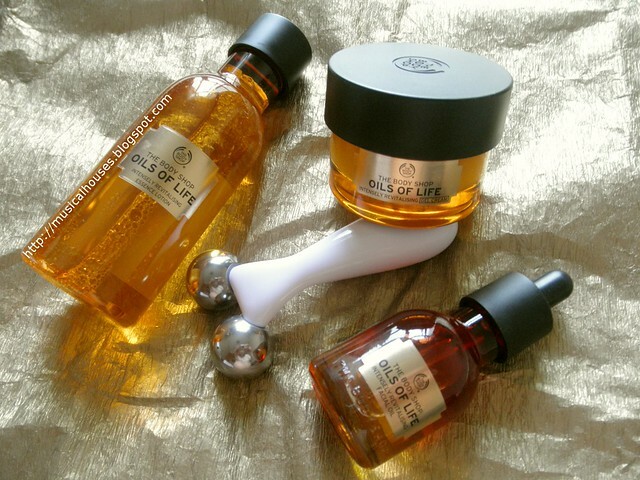 And the name "Oils of Life" - doesn't it sound so tempting? Anyway, since we have 3 (or 4, if you count the Facial Massager) products to review, this post is going to be on the long side! But if you're read, I'm ready, so let's cut to the chase and jump straight to the meat of the post! We're going to look at the ingredient in the products, and also, their textures and how oily/light they are. 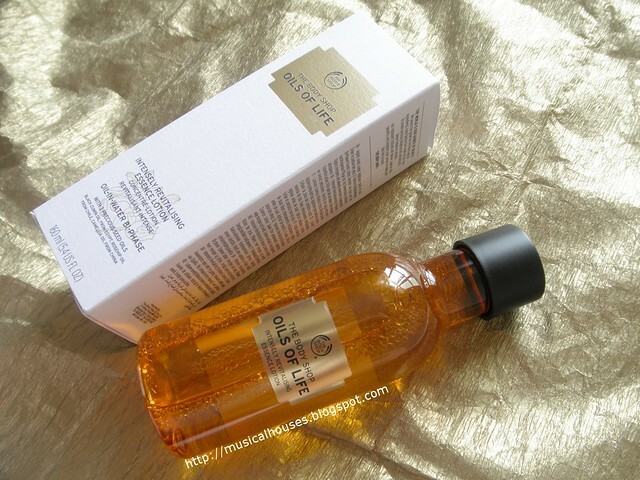 The Body Shop Oils of Life Intensely Revitalising Essence Lotion: Like a Japanese-style Lotion, but oiled up! First, the Oils of Life Intensely Revitalising Essence Lotion. This is basically the "Oils of Life" version of the popular face lotions that you see in a lot of Japanese and Korean beauty brands, and also Western brands too with increasing ubiquity. The difference with this one is thata it has those plant oils inside it! So how does it work? Looking at the ingredients list, we can see that the Essence Lotion is indeed formulated to function like a lotion. The main ingredients are water and humectants (Glycerin, Propanediol, Panthenol), just like you would find in a Japanese-style lotion. There's also Betaine, an emulsifier, and Alcohol Denat., which is probably in there to thin out the mixture (which does contain some oils after all). Also, there are some plant oils, Sesamum Indicum (Sesame) Seed Oil, Rosa Canina Fruit Oil, and Camellia Oleifera Seed Oil. Two of these are the advertised oils on the packaging, so I'm happy to see that these are actually included in fairly significant amounts in the Essence Lotion. (The last one, Black Cumin Oil, is further down the ingredients). So for those who are wondering, yes the "Oils of Life" are indeed in this product in mostly significant amounts. So far, so normal. The interesting thing, though, is the two main emollients (Undecane, Tridecane), which are hydrocarbons with emollient properties. These emollients that aren't soluble in water, and would float if mixed with water. You could dissolve some oils with a solvent or emulsify them (Propanediol has solvent properties for some oils, and Betain is an emulsifier), but because Undecane and Tridecane are saturated hydrocarbons, they generally have quite poor solubility in glycol solvents like Propanediol. So while the Propanediol might function as a solvent for some of the oils (e.g. some of the other oils), it's not going to dissolve the Undecane. Meanwhile, the Betaine, which does help to emulsify hydrocarbons, helps to form micelles to suspend the oils in small droplets in the water - so you get little drops of oil in water, rather than one layer of oil on top of one layer of water. There is also Alcohol Denat., which is probably in there to lighten the feel of a potentially otherwise oily product, and aid with penetration - while alcohol can have some solvent properties, it also doesn't dissolve hydrocarbons like Undecane and Tridecane. So how does this deal with the emollients and the solvents and water affect the product, and how what does the product do when applied? Because the oil droplets are suspended in the water base, net effect is a pretty interesting bi-phase product. This is probably what The Body Shop is going for - the packaging states right on the box that this is a "oil in water bi phase" lotion, and I think that's probably the best way to describe it. In the bottle you can sometimes see little bits of oil suspended in the water, and when I pour out the product, sometimes I see this effect too - in the photo below you can see a glob of oil-like substance floating on top of a puddle of water in my palm. I'm guessing that's the oil phase of the product floating on the water phase of the product, and that's pretty cool. In terms of function, though, it does the job just like you would expect a lotion product to - it has humectants to help moisturize and draw water into the skin, and, because it has various emollients and oils, there is also a barrier-forming property to the product to help prevent TEWL (trans-epidermal water loss, or just evaporation of water from your skin). 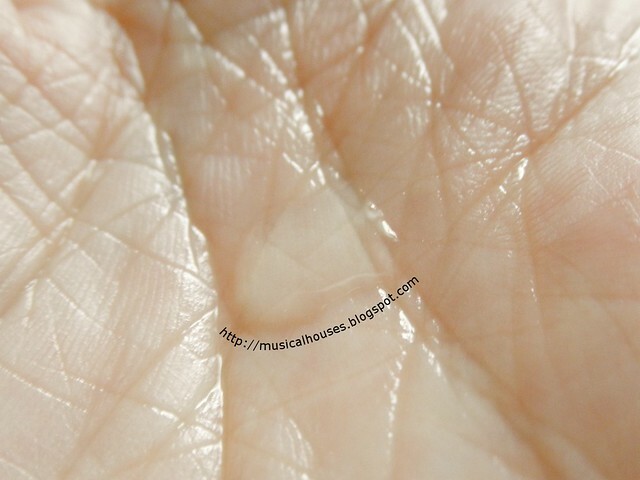 This product also felt a lot lighter than I was expecting - I thought it would be really oily, but it is surprisingly light - it sank into the skin faster than I expected and didn't leave too much residue behind. As with most The Body Shop products, the smell is on the strong side with this one, but I didn't mind at all, because it smelled so good! To my nose it had a rather rich smell with some citrus and rose notes. I'm not really an oils person, but I liked this product much more than I thought I would. 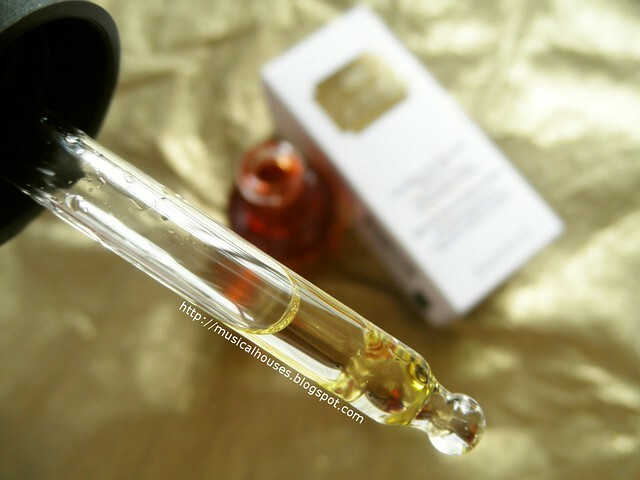 Next, we have the Oils of Life Intensely Revitalising Facial Oil. This, of course, is a facial oil, and you can use this product in conjunction with the Facial Massager if you so desire. It also is advertised as having "99% oils of natural origin" on the box. The main ingredients in the product are Caprylic/Capric Triglyceride, which is an emollient derived from fractionted coconut oil, and some plant oils: Olea Europaea (Olive) Fruit Oil and Simmondsia Chinensis (Jojoba) Seed Oil. Then of course there are the advertised oils, Camelina Sativa Seed Oil, Rosa Canina Fruit Oil, Camellia Oleifera Seed Oil, and Nigella Sativa Seed Oil. 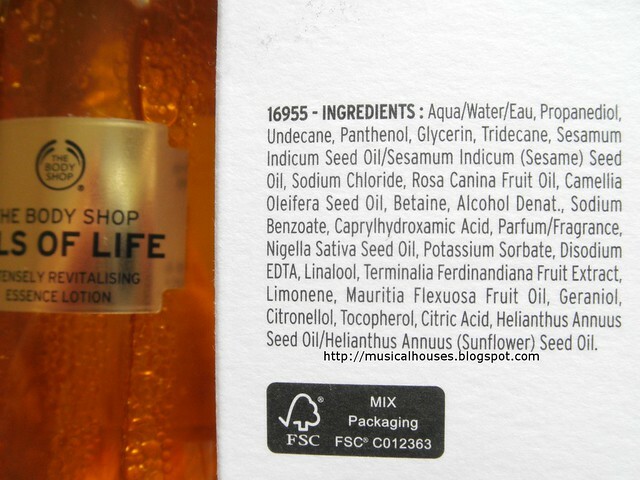 So again, The Body Shop has put out a product that lives up to its advertising - a lot of these ingredients are indeed plant oils or plant-derived oils. After that we hit the fragrance ingredient, and everything else after that is in fairly tiny amounts. 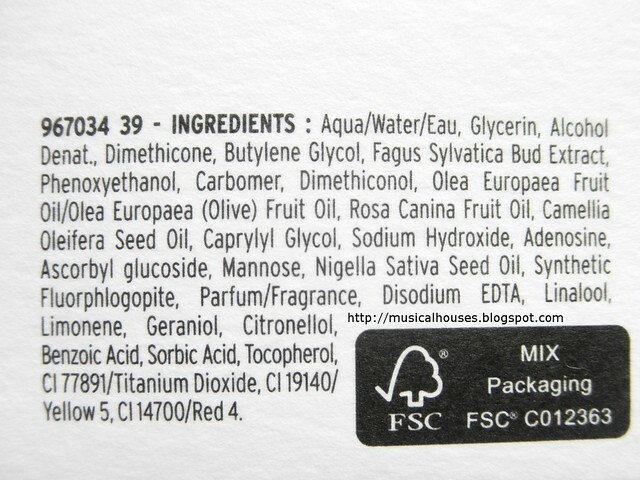 These includes some of the other fragrance ingredients and fragrant oils that might be potentially irritating for some skintypes (Limonene, Linalool, Citronello, Geraniol, Lavender Oil, Orange Peel Oil) but since they are in the product in fairly small concentrations, I imagine that most people's skins would probably be fine with the product. Looking at the formulation as a whole, this is obviously the most oil-like product in the Oils of Life range, due to it being formulated almost entirely with various plant oils. This will definitely appeal to those who like facial oils, and to those who like more natural products. As I expected, this did feel quite oil-like, unlike the Essence Lotion which felt more watery, and was very emollient. It also had a nice, warm rich scent different from the Essence Lotion - on the Facial Oil, I got mostly olive oil, which is probably expected because it is a major ingredient in the product. 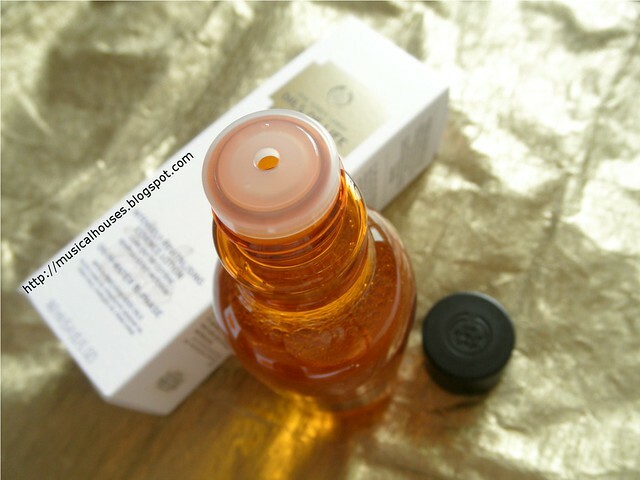 While this did feel luxuriously rich on my skin, I felt like it is probably best suited for dry skins - after all, this is mostly an oil-based product. And the instructions on the box say to dispense 1-2 drops and apply them to your entire face, and given how oily this product is, it's probably a good idea to just keep to the amount recommended. I tried 3 drops just for fun (it's hard to swatch a product with 1-2 drops of liquid, you know), and this felt pretty heavy on my skin. So, less is better for this one! 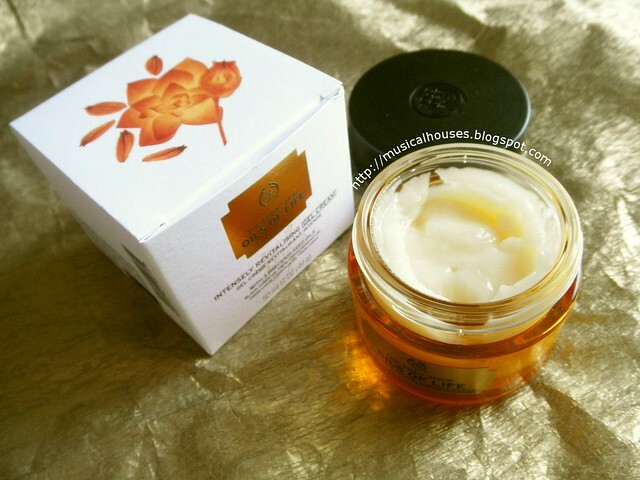 The Body Shop Oils of Life Intensely Revitalising Gel-Creme: "Melting but light and non-greasy"
Lastly, I have the Oils of Life Intensely Revitalising Gel Creme. This again seems like an interesting product - it's advertised to be a "dewy-fresh daily nourishing gel cream infused with 3 precious seed oils", with a feel that's "melting but light and non-greasy". So let's check it out! The main ingredients in the product are water, humectants (Glycerin, Butylene Glycol), Alcohol Denat. (again probably here to lighten the texture or as a solvent), and Fagus Sylvatica Bud Extract. So yes, as far as the main ingredients are concerned, this is going to be quite light. After this we hit Phenoxyethanol, a preservative, that is typically used in levels of up to 0.1%, so the rest of the product ingredients are probably there in 0.1% concentrations or less. So the formulation is indeed in line with the goal to create a lightweight gel-creme. What's in the rest of the product? 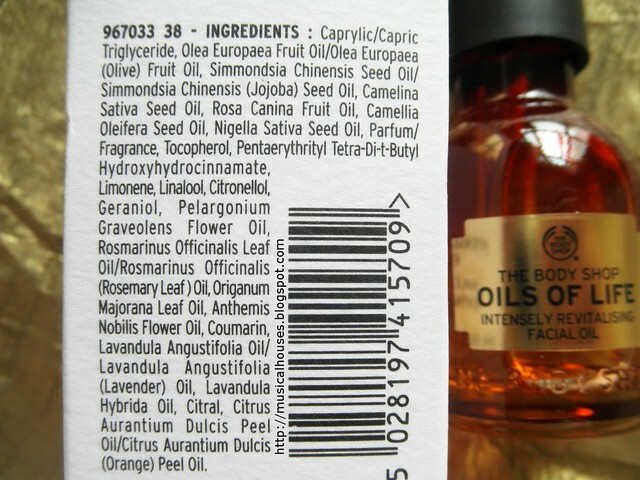 As you might expect, it consists of the plant oils and extracts - there's the three advertised oils (Rosa Canina Fruit Oil, Camellia Oleifera Seed Oil, Nigella Sativa Seed Oil), but also some other oils make an appearance, such as Olea Europaea (Olive) Fruit Oil. Again there are some fragrance ingredients similar to those found in the previous products that may be irritating to some skin types (Linalool, Limonene, Geraniol, Citronellol), but again, they are in fairly small amounts that don't seem to be a cause for concern. So how did this fare for me? To be honest, it was a bit of a mixed bag. It does look like a cross between a gel and a cream, and it felt light when applied on my skin. However, it did leave behind a bit of an oily film/residue on my skin, which I'm guessing is the oils in the product, which I was kind of on the fence with - some people (especially those with dry skins or who live in cold and dry climates) might like this, but I felt like it was a bit heavy-feeling, and as with the Facial Oil, a more measured usage is probably better. Again, the scent in this was great, and I'd probably describe this as in between the scent of the Facial Oil and the Essence Lotion, and to my nose I got mostly citrus and rose. Lastly, let's not forget about the Facial Massager! This is, in my opinion, more of an accessory than a necessity, but if you like face rollers, it might be a nice companion to the skincare. I'm personally not a fan of face rollers myself, because I'm so pimple prone that any form of face massage gives me breakouts and just makes my cystic acne worse (I know - almost 30 and still with the acne, le sigh). But I know lots of people (my own mother, for example) who love these things. The Facial Massager is quite small compared to the other face rollers available on the market, perhaps because it's meant for face rather than body use. It pretty much fits in the span of my hand. You can use it to massage your neck, face, jawline, and other areas. Despite it being small, the metal rollers are fairly heavy and quite substantial-feeling, and the rollers do give your skin a good "pinch" if you use them too vigorously. Given that most of the products in the Oils of Life range are, well, oil-based, the roller is quite a good way to massage the oils on your face for further enjoyment. The oils in the products give an extra slip and slide when the roller glides along your face. If you like face rollers and have no problem with them, I imagine you might like this too. And the small size makes it handy for travel as well. So, after we've sat through a really (really!) long review, would I recommend this range? I'd say, yes, if you are into facial oils or other oil-based products, or if you have dry skin, or if you live in a cold and dry climate. But on the other hand, if you have oily skin, or live in a hot, wet climate where such products may not be that practical for your routine, or if you prefer more watery, light formulations, then these are probably not the best suited for your needs. 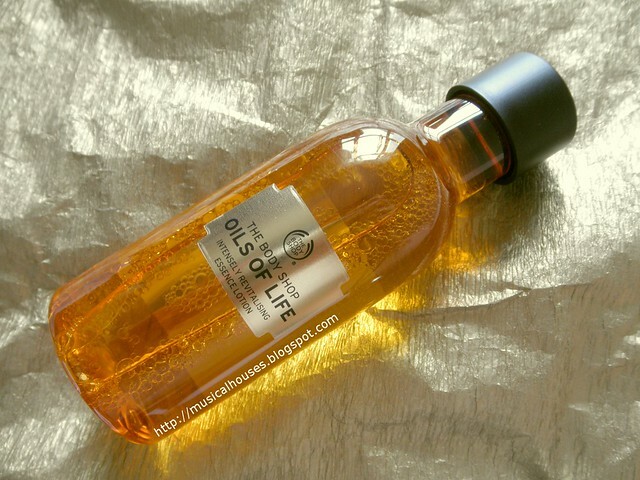 After all, the Oils of Life range, as the name indicates, is formulated to be pretty heavy on the plant oils and emollients (even the less-emollient Essence Lotion and Gel Creme do have plant oils), and The Body Shop does do a good job of including the advertised oils as the main ingredients in the products. So if you've seen the ads, and like the sound of these oils, then you won't be disappointed by the products. Being a person who lives in a hot, wet climate and who doesn't have THAT dry skin, my personal favourite is the Essence Lotion, for its interesting formulation and feel, and for being very lightweight, but I'm sure your favourite product might differ with differences in skin types and climates. The Essence Lotion is priced at S$39.90, the Facial Oil is S$65.90, the Gel-Creme is S$55.90, and the Facial Massager is S$26.90. 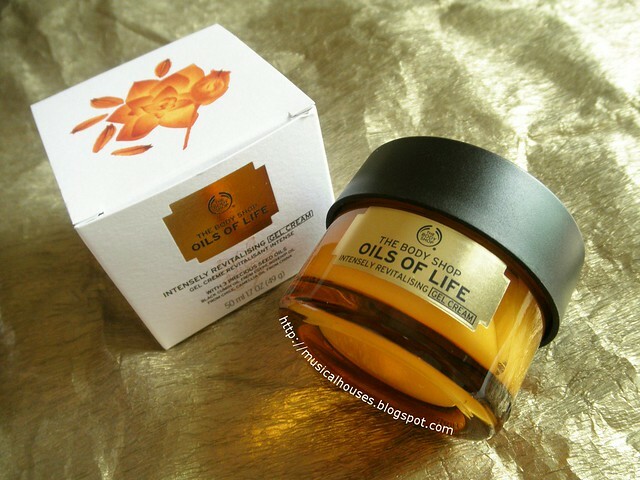 The Bottom Line: The Body Shop's Oils of Life range lives up to its billing, with the 3 seed oils being included in its products in mostly significant amounts. This will please people with dry skins, who like skincare oils, or who live in cold, dry climates. Have been using intense oil with facial massager ... Just beautiful not heavy ,,face feels warm and firm after 10 min treatment..avoid eyes though as can be puffy in morning..smells amazing like a smell in the beauty salon . I need this how can i order?